Karen Mulfort, a chemist at the U.S. Department of Energy’s (DOE) Argonne National Laboratory, was named a 2017 Rising Star by the Women Chemists Committee (WCC) of the American Chemical Society. Mulfort and five other winners will receive the award at the 255th national meeting of the society in March 2018, where she will give an invited talk. The committee’s Rising Star Award, established in 2011, highlights the roles of women in chemistry and promotes retention of women in science. The award recognizes exceptional early to mid-career women scientists who have demonstrated outstanding promise for contributions to their respective fields. Mulfort’s career radiates exceptional skills in every direction — research, teambuilding and decision-making. As a member of Argonne’s Solar Energy Conversion Group, Mulfort is part of a team studying artificial photosynthesis. Photosynthesis is the process used by plants and organisms to convert light energy into stored chemical energy used to fuel their own needs. Mulfort designs new molecular and supramolecular architectures that convert light energy and water into hydrogen and oxygen for eventual use as fuels of all types. A supramolecular assembly — a supermolecule — is an explicitly designed complex of molecules held together by noncovalent bonds — bonds that do not involve sharing electrons. “The ultimate goal is to contribute something that will help society,” Mulfort said. Mulfort’s work builds upon knowledge of the protein reaction center structures that accomplish natural photosynthesis. Mulfort taps into her colleagues’ expertise to optimize molecular modules to accomplish a single step of artificial photosynthesis. She also characterizes, or identifies, the structures and tracks the functional parameters relevant to solar energy conversion. Cynthia Jenks, director of Argonne’s Chemical Sciences and Engineering Division, shares the enthusiasm for Mulfort’s work. ​“Karen’s research with the Solar Energy Conversion Group is internationally leading and a vital part of the division’s strategy for the future,” said Jenks. Mulfort remarked that, although she focuses on basic research, she also tries to see the functional whole in the disconnected parts in all areas of her work — whether building structures for artificial photosynthesis, or combining skills of her highly talented colleagues. She is quick to note that, although the award has her name, it recognizes her entire group’s achievements. Mulfort’s Argonne colleagues ​“are at the top of their game and provide a synergy and tight feedback loop with constant collaborative abilities,” she said. The award-winning chemist has been recognized at many steps in her career. Both the American Crystallographic Association and the American Chemical Society Division of Inorganic Chemistry recognized Mulfort’s research at Northwestern University, performed for her 2008 doctoral degree, on hydrogen storage in metal-organic frameworks. Dr. Jenks’ research areas of expertise include surface structure and reactivity, surface structure-property relationships, catalysis, chemical conversions for sustainable energy, and thin film growth. 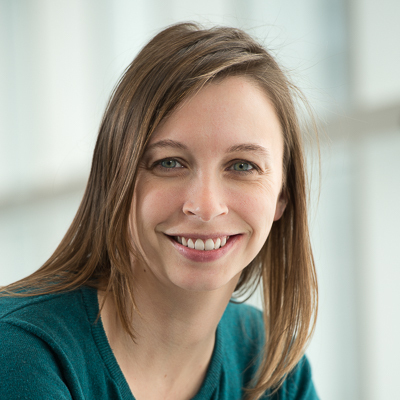 Dr. Karen Mulfort is a chemist at the U.S. Department of Energy’s (DOE) Argonne National Laboratory, was named a 2017 Rising Star by the Women Chemists Committee (WCC) of the American Chemical Society.